Resonate Testing was established in 2015 as a wholly owned subsidiary of The Nacelle Group, the parent company of our highly reputable aerospace engineering organisation; Nacelle Systems Consultancy (NSC). 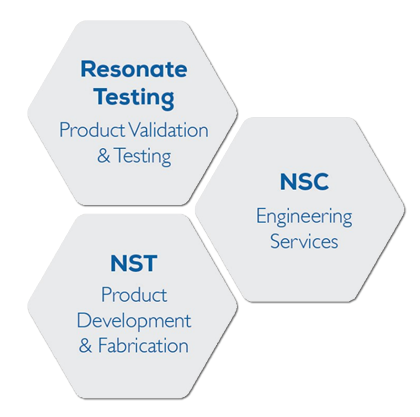 Resonate Testing’s knowledge-base has stemmed from NSC, who have gained a wealth of experience and specialist knowledge in Vibration, Fire and Environmental Testing for its worldwide customer base. NSC’s experience in aerospace engineering provides a key foundation for our capabilities in test specification and certification with the result that customers can be confident of a highly professional and knowledgeable service. Resonate Testing is part of a wider diversification and growth strategy founded upon the practical application of our engineering knowledge and experience. With a 6000sqft facility of purpose-built test space, Resonate Testing can meet testing needs in the industry by offering locally or geographically diverse customers impressive capabilities coupled with a fast turnaround model. The facility includes a Combined Vibration and Environmental Laboratory (the only commercial facility on the Island of Ireland that can perform combined temperature and vibration testing up to 54kN), a Fire Test Laboratory and a general Mechanical Test Facility. Resonate Testing is UKAS accredited to ISO17025 and, as part of The Nacelle Group, certified to ISO9001:2015. Resonate Testing aims to provide organisations with testing requirements the opportunity to utilise our innovative capabilities and testing expertise with a high quality service for all.